Exactly one year ago this hour, the world turned to Haiti. Though many people are concerned about where all the donated money has gone, all of donations to Life and Hope have been used to directly better the lives of Haitians. The progress at our school tells the story (see more below). Combo Sabroso will be back at the VFW for a night of food, drink, reggae and Latin dancing. If you were to visit Milot, Haiti, today you would probably see children wearing Marshwood and Berwick Academy T-shirts, adults in York Beach sweatshirts and dozens of children wearing shoes that once padded along the floors of Central School. You would see boys playing with baseballs collected in Doug’sPortsmouth backyard, toddlers clutching stuffed animals from G. Willikers and hundreds of children holding toys that came from all of you in Kittery, Eliot, the Berwicks and beyond. As a visitor to this impoverished town in northern Haiti, you would see signs of a profound bond that has been growing between our New England community and their Caribbean village. In the last few years, more than a dozen people from southern Maine and New Hampshire have made the trip down to Life and Hope’s Eben Ezer School in Milot. They have seen the children you sponsor, delivered your gifts and used your donations to build bathrooms, dig wells, create playgrounds, paint rooms and hook up electricity. Since 2007, the school has gone from two rooms to nine, and now has a bright yellow library with shelves, electricity, air conditioning and most importantly books. It has been a year today since southern Haiti was turned into rubble and the country’s painstaking attempts at development were shattered. That earthquake generated an enormous response from our southern community, but it was not the start of this connection. The seed for this relationship has been growing since Great Works School and the South Berwick/Eliot Rotary first decided to help the Eben Ezer School three years ago. Life and Hope has created a facebook page so you – sponsors, volunteers, donors and anyone interested in Milot can see photos taken by many of our neighbors who went to visit the Eben Ezer: the Zeff family of Stratham (and Berwick Academy); Agnes Charlesworth and high school student Hannah Drummond of Kittery Point; Stacey Barlow and her high school-aged daughter, Georgia, of South Berwick, Conor Guptill of Berwick and Christopher Gallot ofNorth Berwick, and Rotarian Paul Salacain of York. Many of you may find the children you sponsor in these pictures. Attached to this email is a photo of a child receiving gifts at the Dec. 28 party. 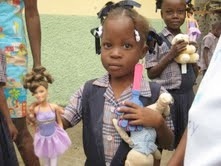 The group that traveled to Milot brought a dozen suitcases and 700 pounds of toys. To see the faces of these children is to know what you, what we, mean to them. Hope to see you and celebrate with you Saturday, April 2.